Is Dollar General Still a Discount? After reporting revenue and earnings that fell short of forecasts, shares of Dollar General jumped 4%. Is this a sign that the company is still undervalued or would Family Dollar or Dollar Tree be better prospects? After reporting revenue and earnings for the first quarter of its 2014 fiscal year on June 3, shares of Dollar General (NYSE:DG) popped up 4% to close at $56.41. While this is good news for investors who got in early, the fact that the retailer's shares are still trading at a 10% discount to their 52-week high might lead some investors to wonder if now is still a good time to jump in. If not, might it be better to consider picking up Family Dollar (UNKNOWN:FDO.DL) or Dollar Tree (NASDAQ:DLTR) instead? Even though Dollar General's stock price rose in response to its quarterly results, it did so in spite of missing analyst forecasts on both revenue and earnings. For the quarter, the discount giant reported revenue of $4.52 billion, missing the $4.56 billion Mr. Market anticipated but still coming in almost 7% above the $4.23 billion reported during the first quarter last year. According to the company's release, this jump in sales came, in part, from a 1.5% improvement in comparable store sales. However, the biggest contributor to Dollar General's top line growth was its higher store count, which rose 6% from 10,662 locations last year to 11,338 locations this year. Of this increase, 214 openings (or 32% of them) took place during this most recent quarter. From an earnings perspective, Dollar General still fell short. Despite the fact that earnings grew 9% from $0.67 per share last year to $0.72 in this year's quarter, management still could not get the retailer's profits to match the $0.73 that analysts hoped to see. This improvement came from higher sales and a 5% reduction in share count, partially offset by the company's net profit margin falling from 5.20% to 4.92%. 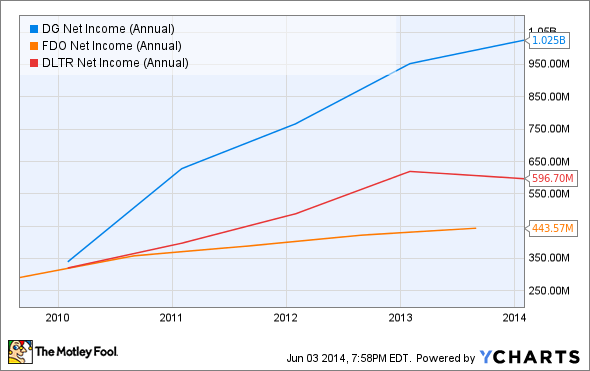 Dollar General's had an amazing run, but how about its peers? 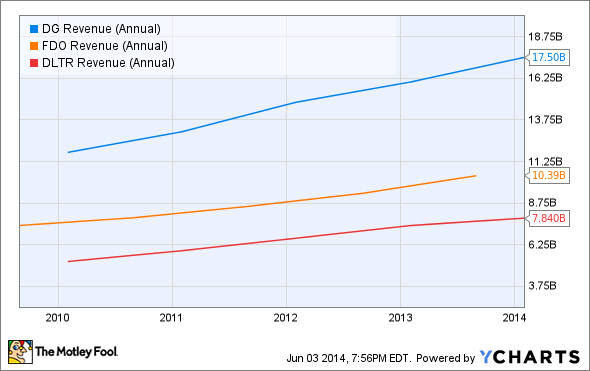 Over the past few years, Dollar General has been a real growth machine. Between 2009 and 2013, the company's revenue jumped 48% from $11.8 billion to $17.5 billion. During this five-year period, management attributed the retailer's growth to its aggregate comparable store sales increase of 32% but also reported that the company's 26% rise in store count from 8,828 locations to 11,132 played a big role. This growth rate did well enough to outperform Family Dollar, but could not maintain pace with Dollar Tree's performance. Over the past five years, Family Dollar grew its sales by 40% from $7.4 billion to $10.4 billion while Dollar Tree's top line growth came out to 50% from $5.2 billion to $7.8 billion. Like Dollar General, Family Dollar and Dollar Tree grew their revenue through improved aggregate comparable store sales, which increased by 24% and 28%, respectively. From a store count perspective, both retailers posted strong results as well, with the number of locations in operation increasing by 19% for Family Dollar from 6,655 in 2009 to 7,916 by the end of 2013 and soaring 31% for Dollar Tree from 3,806 to 4,992 over a similar timeframe. From a revenue perspective, the growth reported by all three discount chains was more or less about the same. From an earnings perspective, however, the differences have been vast. Between 2009 and 2013, Dollar General's net income skyrocketed 202% from $339.4 million to $1 billion as higher sales, reduced operating costs, and interest expenses falling from $345.6 million to $89 million helped improve the company's profitability. During this same five-year period, both of its peers saw higher profits, but not to the same extent that Dollar General did. Between 2009 and 2013, Family Dollar's net income increased just 52% from $291.3 million to $443.6 million, while Dollar Tree's bottom line rose 86% from $320.5 million to $596.7 million. In the case of both companies, the higher net income was driven by higher revenue, but was also due to decreasing costs, primarily in the form of selling, general, and administrative expenses. Based on the data provided, Mr. Market is pleased with Dollar General, even after the company fell short on forecasts. In addition to relying on a rosy forecast for the year, shareholders seem content with the company's recent mediocre results because of its stellar long-term performance. Moving forward, it's difficult to tell if the firm has what it takes to maintain this track record. However, the fact that management has done so well for so long suggests that the company is worth further analysis by prospective investors.